Serving face. 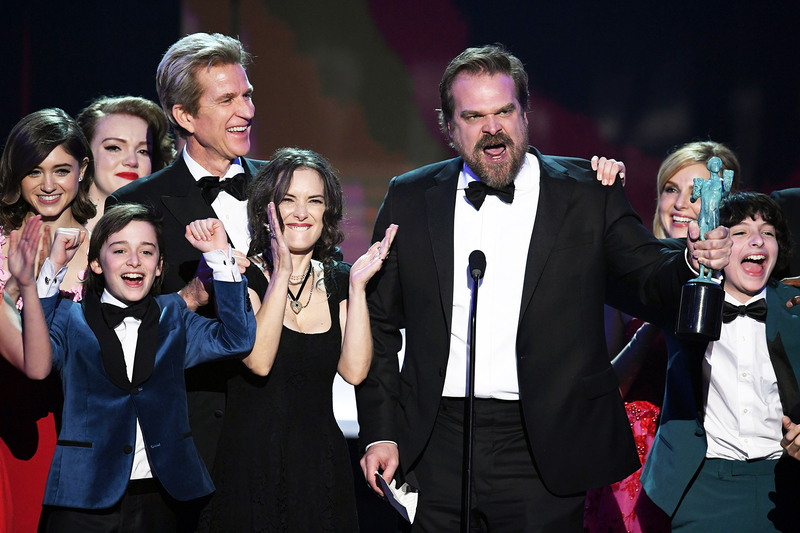 Winona Ryder made an array of expressive faces during Stranger Things actor David Harbour’s acceptance speech at the 2017 SAG Awards on Sunday, January 29, in Los Angeles — and the funny moment was not lost on social media users. Watch Ryder&apos;s reactions in the video above! As viewers saw during Sunday night’s telecast, Ryder, 45, appeared shocked, ecstatic and everything in between while Harbour, 41, delivered a passionate oration in which he not only thanked his colleagues, but spoke out about Donald Trump and his controversial immigrant ban. “It’s a call to arms from our fellow craftsmen and women to go deeper and through our art to battle against fear, self-centeredness and exclusivity of our predominantly narcissistic culture and, through our craft, to cultivate a more empathetic and understanding society by revealing intimate truths that serve as a forceful reminder to folks that, when they feel broken and afraid and tired, they are not alone,” Harbour said, among several other fiery sentiments. At one point during the speech, Ryder — who joined Harbour on stage with young costars Caleb McLaughlin, Noah Schnapps, Gaten Matarazzo, Millie Bobby Brown and Charlie Heaton — appeared to mouth the words “this is too heavy.” However, she was seen cheering loudly as Harbour’s remarks came to a close. Naturally, the internet took notice of the Girl, Interrupted star’s whirlwind of emotions and responded with hilarious tweets and memes. Take a look at some of the best online reactions below.